Traditionally found roaming the isle of Summerset, Indriks are especially powerful magical creatures, and they can provide a challenge for even the most experienced adventurers. While it is possible to hunt them in the wild, it is also possible to acquire one as a mount. In order to acquire the Nascent Indrik mount, players must take part in four in-game events and collect four magical feathers, with a different one available for each specific event in 2018. See the main page for full details. Its default name is "Quiescence". This chilling steed was created from a Frost Atronach that was conjured into the shape of a horse. Perfect for an adventurer visiting a warmer climate, this steed can help you stay cool even in extreme temperatures. 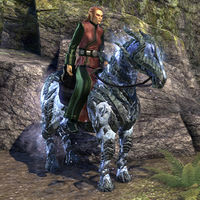 The Night Frost Atronach Steed is a Frost Atronach horse available in the Flame Atronach Crown Crates as a Radiant Apex-level reward. Its default name is "Winter". The origin of this horrific mount is obscure, but some see the hand of Mehrunes Dagon in it. 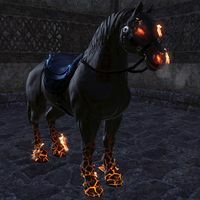 The Nightmare Courser is a fiery black horse mount available from the Crown Store for 025002,500 . Its default name is "Darkness". The Nightmare Courser has unique sound effects. The origins of this terrifying mount are obscure, but some see the hand of Mehrunes Dagon in it. 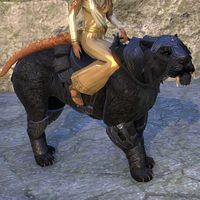 The Nightmare Senche Mount is a black, flaming Senche panther mount that came free with any preorder of the Summerset Chapter. It is similar in appearance to the Nightmare Courser horse. Programmed for obedience and fabricated for endurance, these synthetic Nix-Ox Steeds are the perfect mounts for ranging out from the Brass Fortress across the dangerous Radius. The Nix-Ox Fabricant is a mount available from the Crown Store between January 11 and 15th, 2018 for 035003,500 . Its default name is "Oily". It was the warlike Erabenimsum tribe of Ashlanders who first broke the wild Nix-Oxen of Vvardenfell to domestic use, and an Ashkhan, the legendary Ashu-Ammu, who first rode one into battle. 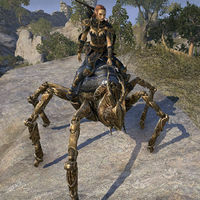 The Nix-Ox War-Steed is a free mount given to those who owned the Morrowind Chapter during certain promotional periods. It was first given away to Morrowind owners who logged in at any point from November 17 to November 28, 2017. The promotion later returned and lasted from December 22 to December 31, 2017. Its default name is "Thoraxo". The Noble Riverhold Senche-Lion is available as an exclusive ESO Plus Deal From December 20th, 2018 to January 3rd, 2019, and will become available in the Crown Store to all ESO players in January of 2019 for 025002,500 . Its default name is "Pridesteed". During the Jester's Festival even the lowliest of commoners can pretend to be a mounted knight with a whimsical Novelty Stick steed. Dragons are popular in the Ebonheart Pact. The Novelty Stick Dragon was available in the Crown Store throughout the duration of the 2019 Jester's Festival for 350 Crown Gems. Mount Skill Training does not affect this mount's appearance or speed. Its default name is "Mightyscales"
The Novelty Stick Guar was available in the Crown Store throughout the duration of the 2019 Jester's Festival for 00900900 . Mount Skill Training does not affect this mount's appearance or speed. Its default name is "Guar Sticklord"
During the Jester's Festival even the lowliest of commoners can pretend to be a mounted knight with a whimsical Novelty Stick steed. Horses are popular in the Daggerfall Covenant. The Novelty Stick Horse was available in the Crown Store throughout the duration of the 2019 Jester's Festival for 00900900 . Mount Skill Training does not affect this mount's appearance or speed. Its default name is "Charger Lord"
This page was last modified on 3 April 2019, at 19:44.